This article will introduce you to the primary components of a professional-quality belly dancing costume. You can make your own items, or purchase them from various vendors. If you are inclined to make your own costumes, see Belly Dance Costume Patterns elsewhere on this web site for information about pattern companies who make patterns suitable for belly dancing costumes. This is the costume that most people think of when they think of a belly dancer. For a traditional look, the costume would be made following the guidelines below for the "Sparkly Aesthetic". For a more modern look typical of Tribal style, this costume would be made following the guidelines below for the "Earthy Aesthetic". The photo to the right was taken by John Rickman Photography. Your choice of fabrics, embellishment, and accessories will determine whether your costume looks like a professional dance uniform or a hobbyist outfit just for fun. It will also, of course, have a significant impact on the cost and length of time it takes to make the costume. You are planning a dance representing the style of Egyptian dancers somewhere between 1930 and 1990. You are dancing for American audiences who expect the stereotype of a belly dancer. You enjoy a retro look. You embrace the original costume format of American Tribal Style. Click on either image below to see it in more detail. Some dancers feel attracted to the glamorous, sparkly aesthetic of beads and sequins, while others feel more drawn to an earthier look of natural fibers and materials. The realm of belly dance costuming offers attractive options for both types of preference. Shira is wearing a costume purchased in Egypt in 1999. 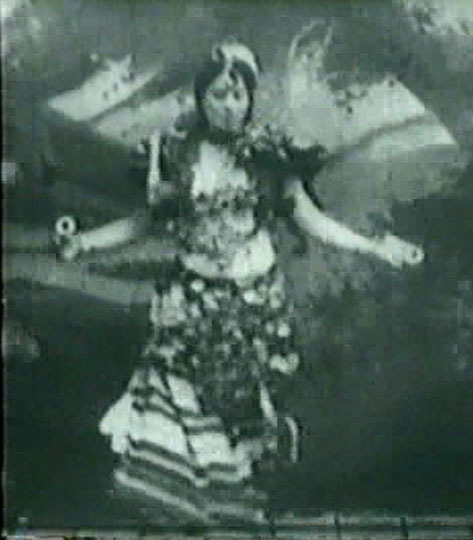 This is a still from an 1897 video of a Ghawazee dancer. The "Sparkly Aesthetic" is best suited to dancers who love glitter and glamor. The "Earthy Aesthetic" is best suited to dancers who prefer natural fibers and embellishments, such as those who embrace the American Tribal Style of belly dance. A dancer performing with "office hair" looks incomplete, as if she is in costume only from the neck down. 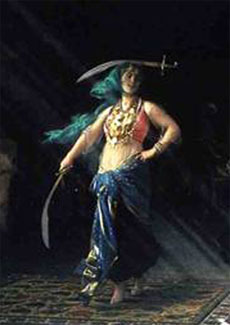 A hair accessory or headpiece adds the finishing touch, transforming her from an ordinary mortal to a Dancer. These photos show two different ways to wear a rectangular head scarf such as the one in the "Sparkly Aesthetic" drawing above. Instructions to make one of these appear elsewhere on this web site. Of course, there are many other types of accessories that can be worn on the head, depending on what the rest of the costume looks like. These could include head veils, decorated hair clips, hair extensions, head jewelry, and many others. The photo on the left above is by John Rickman Photography. The photo on the right is by William M. Smith. Some dancers feel a bit too bare, a bit too exposed wearing just a decorated bra on top. Adding a vest or choli like this provides just a little coverage, and also balances the fullness of the skirt somewhat. You can either cut the garment with a straight line across the back, or you can put a point in the middle. You can decorate the point with a tassel. This vest can be made in glittery fabric for a nightclub look, or a natural fiber such as cotton for a more earthy or historic Ghawazee look. The neckline and armholes can be outlined with single-strand sequin trim, or left plain. Set-in sleeves can optionally be added to make it a jacket. Some large-busted dancers feel that this vest gives them a little additional support beyond what a bra alone might give. The choli can either be worn under a costume bra, or cut away at the neckline to frame the bra. For a professional-looking costume, choose a choli made of an ethnic textile such as a rich brocade or fabric from India which has been embroidered or embellished with shisha mirrors. For practice wear and student shows, a choli made of a washable cotton stretch knit is comfortable. A company called Atira's Fashions offers a pattern called Marvash's Turkish-Arab Vest for making a keyhole vest like the one pictured above, and Folkwear's Tribal Dancer pattern contains instructions for the choli shown above. Click here for more information on sources for these and other belly dance costume patterns. The sleeveless vest with the keyhole neckline shown in the "Sparkly Aesthetic" above originates from a garment that was actually worn by dancers of Egypt in the past. In the 1876 painting by Jean-Léon Gerôme shown to the right, the dancer is shown wearing one of these vests layered over a sheer white gauze blouse. Click on it to see more detail. These vests were a common part of the attire of professional awalim (dancers in Cairo) into the first part of the 20th century, until the more European bra / belt / skirt costume we know today replaced it as the preferred dance costume. 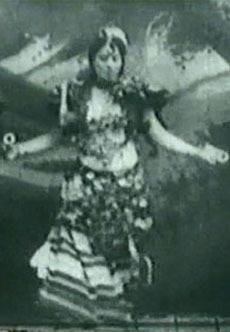 In 1979, the dancer Morocco filmed a performance by the Banat Maazin Ghawazee in which one of the sisters was wearing a vest similar to this one over a tank-style leotard. The belly dance costume bra consists of a sturdy bra purchased from a lingerie store and then decorated. When trying on bras, take along whatever padding you intend to use so you can see how your bustline will actually look in the completed bra. It is wise to purchase a bra that is slightly larger than the desired finished size, as the stitching used to cover the bra with fabric and decorate it can compress it to a slightly smaller size. Either front-hook or back-hook is acceptable — choose according to which one gives your bustline the most attractive shape when you look in the mirror. Select a bra that has a hard shell on the cups, not delicate lace — coins and beaded fringe are heavy, and it's necessary to pick a bra that's sturdy enough to support all that weight. Sometimes dancers replace all the straps on the bra to give it a new shape. For example, they might convert standard one-over-each-shoulder straps to a different style to make the bra look less like underwear. If you are a "C" cup or larger, avoid using a halter strap that goes behind the neck — all the weight of your breasts plus the decorations will give you a genuine pain in the neck after wearing it a while! Instead, either criss-cross the straps in the back or put a T-bar across the back to keep the straps from falling off your shoulders while you dance. Cover the cups and all the straps with suitable fabric. See lists for suggested fabrics. Then decorate by attaching either coins or beaded fringe. Add a secondary clasp at the opening, so that if one set of hooks gives way, the secondary set will prevent it from flying open. Important note: Cover the entire bra, including all straps and the band. Do this even if you plan to wear a vest over it - because sometime in the future you may want to wear the bra without the vest, or sell it to someone else. There should be no lingerie hardware showing when done, to ensure that the completed item no longer looks like underwear. It looks extremely tacky to perform in a bra that has strap adjustment hardware and original elastic showing - it looks as though the dancer doesn't give a damn about her appearance. Suggested embellishments for the two different looks appear below in Section "E" - Belt. If your vest or choli does not have attached sleeves of its own, consider wearing some separate sleeves or gauntlets. Several ideas for sleeve variations are in an article by Dina, the Costume Goddess elsewhere on this web site. If the choli or vest is made out of a rather plain fabric, wear eye-catching jewelry at the wrists to dress up the overall effect. For an "Earthy Aesthetic", there are many ethnic jewelry options from North Africa and Central Asia that can add interest while coordinating with the overall look. The photo to the left shows a costume with form-fitting crocheted gauntlets. The photo to the right shows a costume with sleeves of the same type as shown in the "Sparkly Aesthetic" diagram above. Click on either of these photos to see more detail. Both of these photos were taken by John Rickman Photography, San Jose, California. Like the Turkish vest, sleeves can provide a little more coverage on the top half of the body, making the dancer feel somewhat less exposed. Their fullness also helps balance the fullness of the circle skirt. So far as I know, this style of sleeve was invented in the United States. (If anyone reading this can provide me with documented evidence of their origin, I'd be happy to include that information here on this web site.) The sleeves pictured in the "Sparkly Aesthetic" drawing at the beginning of this section are stand-alone, not attached to the vest or any other part of the costume. Their puffiness provides a very feminine look, and they look attractive on just about everybody. Some dancers are sensitive about having arms that are either too thin or too flabby. These sleeves help ease such concerns, because they cover most of the arm and eliminate one of the worries that can interfere with the dancer delivering her best show. Covers the elastic on the top edge of the skirt. Calls attention to hip movements such as shimmies and hip lifts. Balances the look of the bra. Echoes a long-time practice of Middle Eastern women of tying some sort of scarf around the hips before starting to dance. The belt can be as simple as a narrow band with decoration sewn on it by machine, or as elaborate as a hand-embellished confection. The choice of embellishments will determine which aesthetic it suits. The belt should be made of the same fabric as that used to cover the bra, and decorated with items that match the ones used on the bra. For example, if the bra is embellished with Swarovski crystals and glass beaded fringe, then the belt should also be decorated with the same items. The belt can be made of different materials and embellishments from the bra. 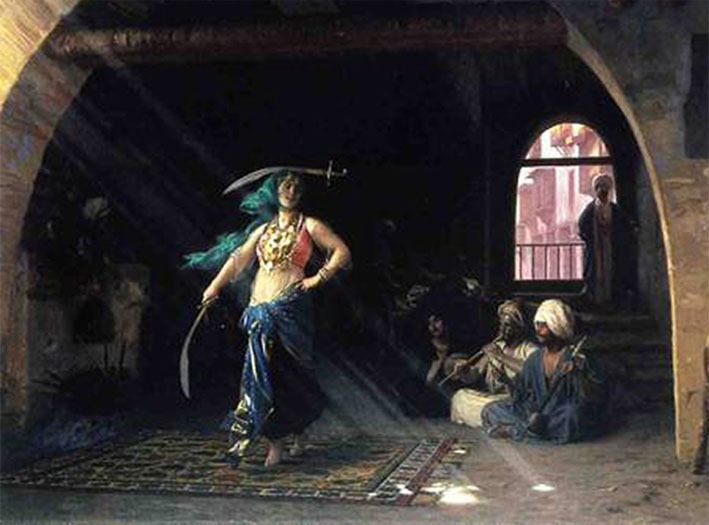 For example, the bra might be covered in simple black fabric and then a bra cover of coins attached over it, while the belt might be a textile from India that is decorated with shisha mirrors. For the "Earthy Aesthetic", although the bra and belt don't need to match, it is important to plan ahead for the finished look and look for other ways to tie the look together. Without planning and careful thought to what the finished effect will be, the costume risks looking as though the dancer just threw together any old thing without caring about her appearance. The appealing thing about a coin belt is that it makes noise when you shimmy. That calls attention to your movement and enhances the dance. Beaded fringe also looks very pretty, but it won't jingle the way coins do. A skirt can be worn as a single layer if the fabric is not see-through. Dancers who prefer coverage on their legs can wear pants underneath — either sheer or made of an opaque fabric. When dancing outdoors, pantaloons are a particularly good idea because a gust of wind might blow the skirt up and expose more than the dancer intended. 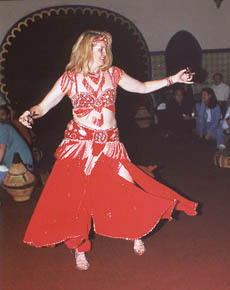 The classic style worn for belly dance is a circle skirt made with 3 half-circle panels. The design appeals to many dancers because it has no bulk at the waist, but plenty of fabric at the hem to swirl along with spins and other dance movement. Instructions to make one appear elsewhere on this web site. Multi-tiered skirts became popular belly dance attire in the 1990's with the growth in popularity of American Tribal Style bellly dance. Many dancers like to use a different print for each tier, each with similar colors to tie the look together. The fabric chosen for making the costume plays a major role in achieving the desired aesthetic. Ask the Costume Goddess: Hair Style Ideas for Long Hair. By Dina Lydia. Ask the Costume Goddess: Hair Style Ideas for Short Hair. By Dina Lydia. Ask the Costume Goddess: How to Cover a Bra. By Dina Lydia. Ask the Costume Goddess: Sleeve Variations. By Dina Lydia. Ask the Costume Goddess: Making Gauntlets. By Dina Lydia. Ask the Costume Goddess: Making Your Own Belt Pattern. By Dina Lydia. The Undercover Story: What About Underwear? What to wear under your costume. How to Make a Rectangular Head Scarf. Such as the one featured in this article. Belly Dance Costume Patterns. For making a wide variety of costume items. How to Make a Circle Skirt. Such as the one shown in the "Sparkly Aesthetic". What Makes a Professional Costume?